BRYAN EATON/Staff photo. 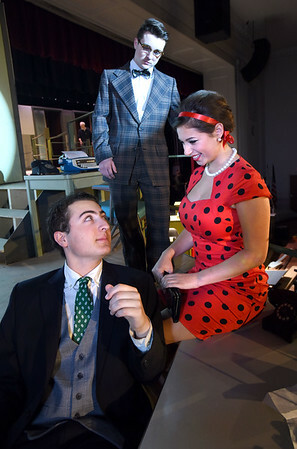 A scene from the Newburyport High School Theatre Department play "How to Succeed in Business Without Really Trying" portrays Zachary Elia as J.B. Biggley, left, Chloe O'Connell as Hedy Larue and Collin Comeau as Bud Frump, rear. The show starts at 7 p.m. March 3,4,9,10 and 11 in the school auditorium with tickets at $10 for students and $12 for adults.